This article originally appeared on the blog Lifelong Michigander in August 2014. You’ve probably seen the stickers on the back of cars, denoting mileage. 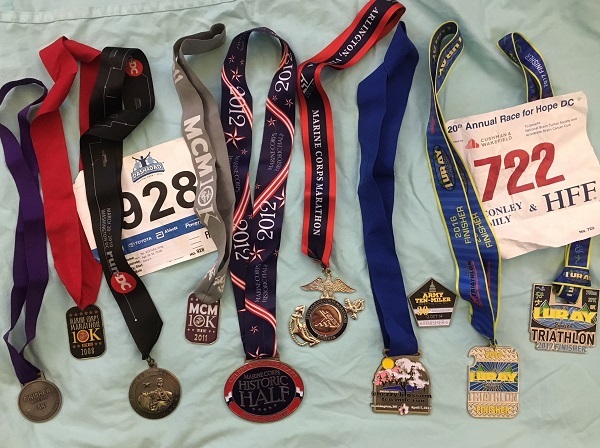 Reading 3.1 for a 5k race, 26.2 for a marathon, and 140.6 for an Iron Man triathlon. After this last weekend, I added a new one to the back of my vehicle: 295.95. You see, this past weekend, my ten-person team completed the 23rd annual Great Lakes Relay. The GLR is a three-day relay race that began with a bunch of nutty runners racing from the St. Clair County seat of Port Huron to the foot of the Mackinaw Bridge at the tip of the Lower Peninsula. 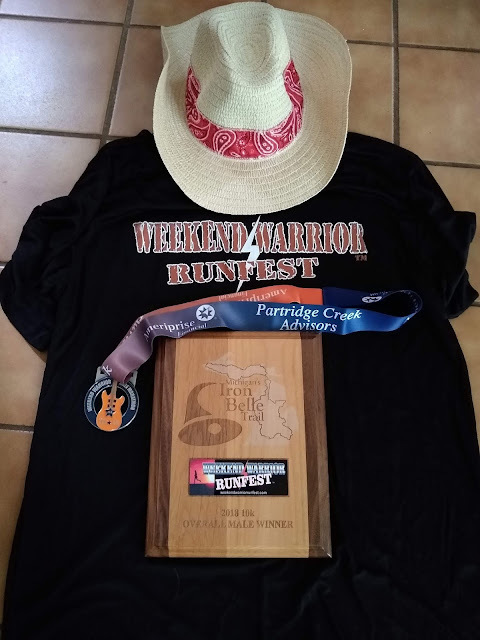 Over the years, the course has been altered depending on interest and the allowances of the local governments, and this year, for the first time ever, the race included a day in the Upper Peninsula. Ten people, three days, trail running from Tahquamenon Falls to Sleeping Bear Dunes? What was not to love? I was soon to find out that, from the perspective of many of my teammates, there were many things not to love. The course was difficult, the accommodations lacking, the organization iffy. But I remained undeterred. Three days of trail running from Tahquamenon Falls to Sleeping Bear Dunes was, just like the state of Michigan itself, full of experiences to love. The relay began at 6 a.m. on Friday, July 18, with a 5.2-mile leg along the river, and 17 legs followed, at distances anywhere from three to nearly twelve miles. The idea was to tag off to your next runner, but at 2 p.m., the race officials encourage concurrent running, so that all teams, including slowish, oldish ones like ours, could finish by 6 p.m. My leg was the fourteenth of the day, so I was running concurrently, not able to tag off to my teammates. It was also much later in the day, so I could spend my morning socializing with other runners. We all met up at the exchange point south of Whitefish Bay, deep in the woods, covered in Deep Woods Off. I ran into friends on other teams and learned more about our competition. Some standouts were the teenagers in short shorts and sports bras, who would most likely beat my mile pace two times over, and the bearded dudes in Rocky IV-style American flag shorts who were apparently already drunk, and, rumor had it, had other substances to keep them entertained over the weekend. After we met our runner coming in from Leg 5 (the hardest 12 miles he had ever encountered in his life; he had to recover his shoe from the shin-deep mud) and sent our Leg 6 runner on her way, we all climbed into our support vehicles and headed on to our next exchanges. 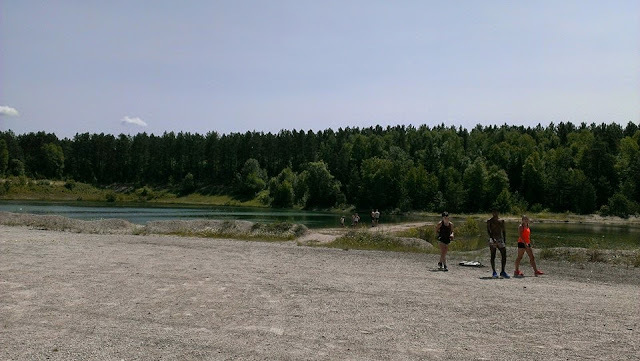 Some runners were headed to Soldier Lake (near East Soldier Lake, and the much smaller Toy Soldier Lake), some to Pine River. My group was headed farther south. We first stopped in Strongs Corner at what is perhaps the most perfect example of “everything you need in one spot” up north ingenuity. The Strongs Corner Tavern was a gas pump outside of a bar attached to a motel. I used the bar’s restroom and discovered that this was Pat’s Bar (based only on the sign above the cash register, but why would that steer me wrong? ), and not only was it a bar, but it was a pool hall, a dry-goods grocery store, a coffee shop, an internet café, Pat’s office (complete with la-z-boy), and a carefully curated showroom of taxidermied animals and game mounts. I found myself wanting to linger, but I purchased my Diet Pepsi and Snickers and hit the road. At this point, we were off to drop my husband at his run. He chose to do two legs, back to back, to cover 15 miles. He was in training for a full Iron Man, and this piddly relay wasn’t going to get in the way of that. His run went along a brook, and one leg was called “Don’t Go to the Beaver Dam.” The directions were adamant, advising him no fewer than three times to not go to the beaver dam. We drove ahead to the exchange where he’d finish eight miles and start his next seven, and I improvised a note to attach to two water bottles using a scrap piece of paper, a sharpie, and chewing gum. The gentleman monitoring the exchange site assured me he’d get him his water, and I trudged back to the car; just like Pat’s Bar before it, I stared wistfully at Trout Brook Pond, wanting to be done for the day and wading in it, not still anticipating my first run. I did not see a beaver dam. It was now time for my run, “The Escarpment Leg.” I am an intelligent woman, but I didn’t know the term “escarpment.” If I had, I would have realized what I was in for. The Escarpment Run was 7.4 miles along the very definition of an escarpment: a long, precipitous cliff-like ridge of land and rock. I chose this leg blindly because I love water, and in the description I saw that I was to cross a small river via footbridge. It sounded charming. It was not. It was terrain suitable for a mountain goat. The ground was covered in prehistoric black rocks that created uneven steps in all directions, most of them covered in moss. It was like a game of Qbert, or Led Zeppelin’s Houses of the Holy album cover. The trail continued in this fashion, interspersed with gnarly tree roots, for the first two to three miles. It took me less than half a mile to fall, cutting both knees and my elbow. The terrain changed, and I was running through ferns that came to my chest. I wish that I could say that I was employing hyperbole to create a more compelling story, but I am not. These ferns were nearly five feet tall, and they were compelled to untie my double knotted shoelaces three times. These trails were very overgrown, but it was obvious that at some point they were well-groomed, because there were boardwalks on which to run, through the more marshy areas. I thought this might be an improvement, but it was not. Imagine running on a surface slightly wider than your own hips. Now imagine that this surface is wood that recently was exposed to one of the harshest Michigan winters in decades. Up until this point I had been running (and, let’s be honest here, walking), in solitude. The forest was silent; there were no outside noises of traffic, no other runners, not even any animals (that I could see). And then they come upon me. The fast runners. The high school kids and wiry older men. The people who could breeze through these rocks as if they were ballerinas jeteing across a stage. These runners came upon me and passed me, but unlike a road race, when a competitor dashes around you with no regard, they all told me “good job,” asked how I was, or made some pithy comment about the course. (This is runner small talk. Elevators are for “nice weather we’re having.” Trail races are for “Oh my God, they weren’t kidding about this, were they? !”) It was actually a moral boost. I finished the run. I finished through dark pines and a small incline to come out at the seasonal road where other runners were waiting. No one from my team was there to meet me. I knew that would happen, and I wasn’t upset. I bummed water from another team and lay back on the shoulder of the dirt road, soaking up the sun and absentmindedly brushing away spiders. My team came to collect me, and we all headed south, back over the bridge, to Mackinaw City. 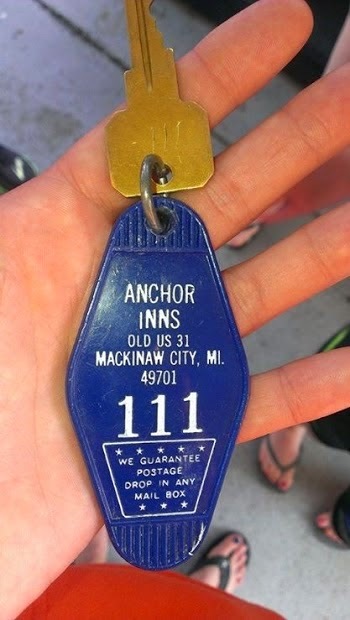 Since the runner who booked that night’s motel was still on her way south with her credit card, we sweet-talked the proprietor of the motel to let us in the room without running it for the balance. The key was very last century. The end of day one, after covering 112.5 miles, was food, beer, and bed. No one got (too) lost. My knees seem to have been the only injury. Only one tick was spotted, and zero bears. For Day 2 of Jamie Stec's experience at the Great Lakes Relay, click HERE.